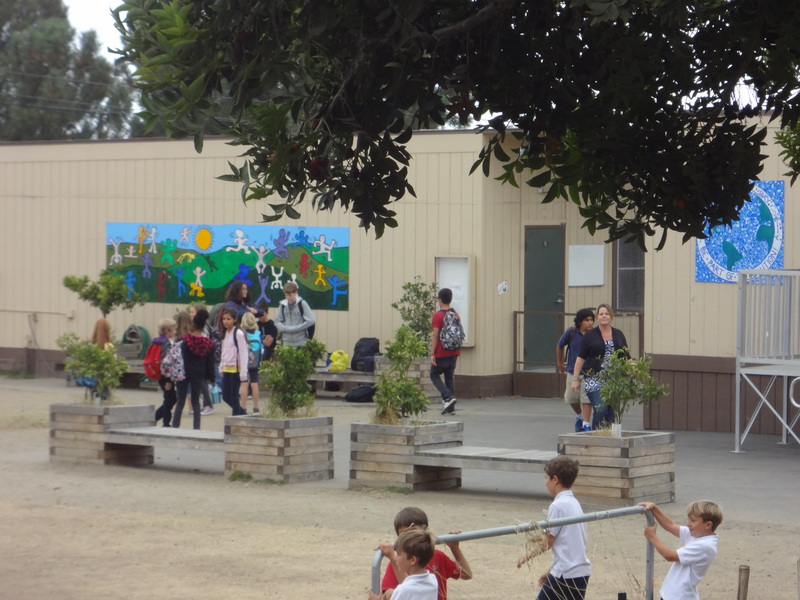 The first school in our series on ‘German Schools in California’ is in San Diego. It is the Albert Einstein Academies, located in Southpark near Balboa Park with its many museums. From the outside looking like one of many other public schools there is nothing that suggests that this building hosts quite a different version of an American public school until one enters the school’s premises, and suddenly is greeted by murals depicting German “Fachwerkhäuser” and a “Brezen Bäckerei”. 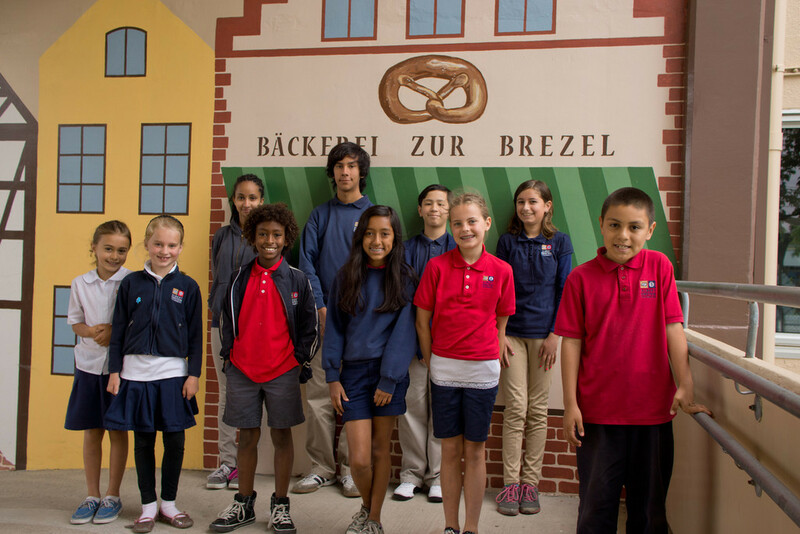 Albert Einstein Academies, a Public Charter School, is one of only three schools in California that offer a K through 8 International Baccalaureate (IB) continuum, but the only one that offers a German-English immersion within this IB program . Since 2008 Albert Einstein Academies is also an official German Partner School (PASCH). All the fabulous education this school has to offer is free! Having started out in 2002 with only 24 students and in rented rooms of a church, the school has grown into over 800 students and is slowly growing out of its present school site. Initially just an elementary school, Albert Einstein Academies now offers also a middle school and is working on expanding into a High School as well. The school has become very sought after in San Diego for its high academic standards, and since there is no school tuition for public schools, it makes the school evermore attractive! So if you live in the San Diego Unified school district, consider yourself lucky since you at least can apply to this popular school via an official lottery. Birgit Schafer, elementary language coordinator at Albert Einstein Academies, is one of the school’s true veterans. She has witnessed the school’s growth since the very beginning. Her son was one of the first students to start first grade with only 24 other registered students at the newly opened school. “We have just grown exponentially over the past years, and our success shows that we are on the right track. With our 9 out of 10 Academic Performance Index (API) we are among the top ten schools in the district wide ranking!” says Mrs. Schafer. Applying to the school has become highly competitive and the waiting list is long. “We have about 300 children every year who we have to put on a waiting list” points out Mrs. Schafer. An official public lottery decides on the final admissions. Priority is given to German-speaking students, but the selection process stays competitive also for them. In order to guarantee the dual immersion program with the German language, the school is officially allowed to fill 25% of their over all applications from a pool of German-speaking applicants. You might therefore have a slight admission’s advantage if your child speaks German. But since applications by German speakers have equally increased over the years, a lottery makes the final decision also here. To be admitted into the pool of German speakers, students have to pass a special test that will determine German language fluency. “This testing is difficult particularly for the younger children who are often shy”, so Mrs. Schafer, “but for an immersion school like ours, it is important to have fluent and native speakers in all classes. They are speech models in the immersion classes.” She further points out that, since the children not only learn speaking German through classroom instruction, but also from interaction with each other, it is critical to have a certain amount of German-speaking children in a class. Walking through the school and visiting some classrooms I am in fact impressed by how much the German language is present in every classroom. 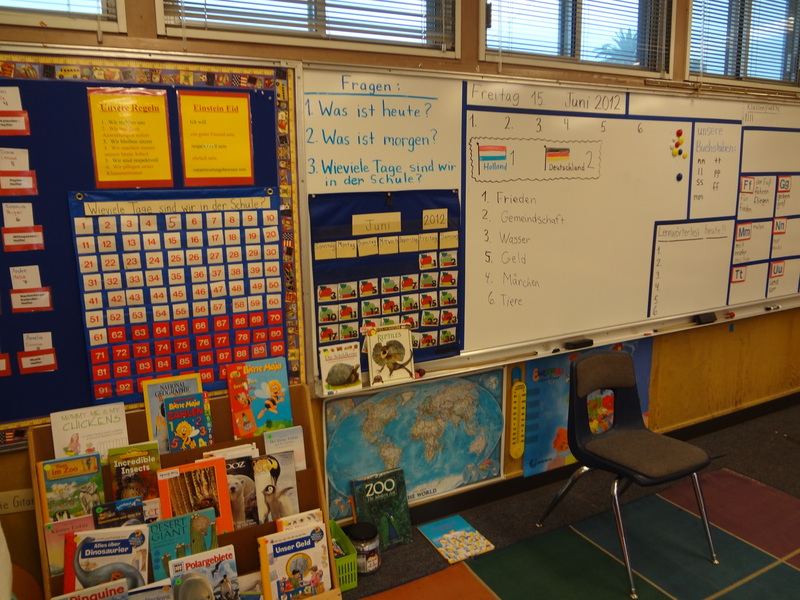 This is particularly visible in the elementary classes K-5 where the dual immersion program guarantees that “50 percent of the total instruction time including core subject instruction is taught exclusively in the German language” (ABE website). The instruction alternates between German and English on a weekly basis and is continuous. Options for students planning to enter Albert Einstein Academies at a higher grade level but speak little to no German. 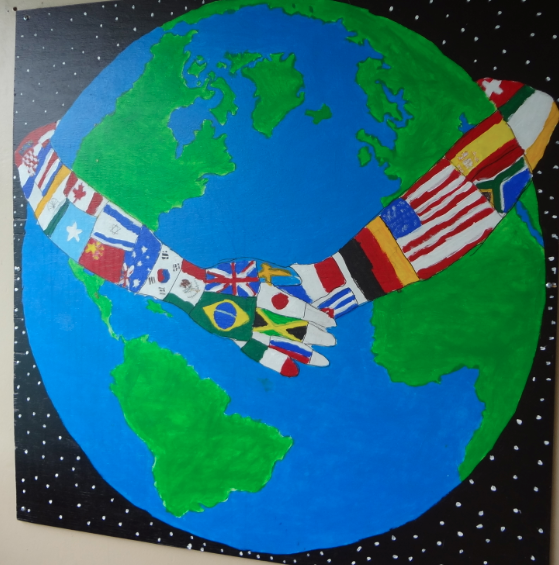 The school has incorporated a “Foreign Language Pathway” class that academically goes along with the three regular German immersion classes in a particular grade level. Available from third grade on the “Foreign Language Pathway” class makes it not only possible for non-German speakers to join the school at a later time, but it also gives current students of an immersion class the option to withdraw from the immersion part, but still stay at the school, and enjoy the benefits of the unique IB program and an international community. While the IB program continues throughout Middle School the Dual Immersion does not. In Middle School (6-8 grade), the students actually can decide on which language they would like to concentrate on, and can pick between German or Spanish. At the moment 220 of the 300 middle school children chose to continue with German while 80 students went on to study Spanish. To further deepen language skills in either language the school has a foreign language exchange program in place with a Gymnasium (High School) in Germany and a High School in Mexico. Apart from the extraordinary language immersion opportunity for children, Albert Einstein Academies offers a well-rounded curriculum along the guidelines of the IB program incorporating California State Academic Standards. In addition to that an extensive after school program encourages all students to get involved in many other learning opportunities. From German Drama & Choir to German Soccer, Spanish Club, Mad Science, martial arts, yoga and much more. Special workshops sponsored by the “Friends of Albert Einstein’s German Cultural Commitee” offer additional cultural immersion into Easter, Christmas and other German traditions. All the classrooms I visit have a very inviting, friendly learning atmosphere. 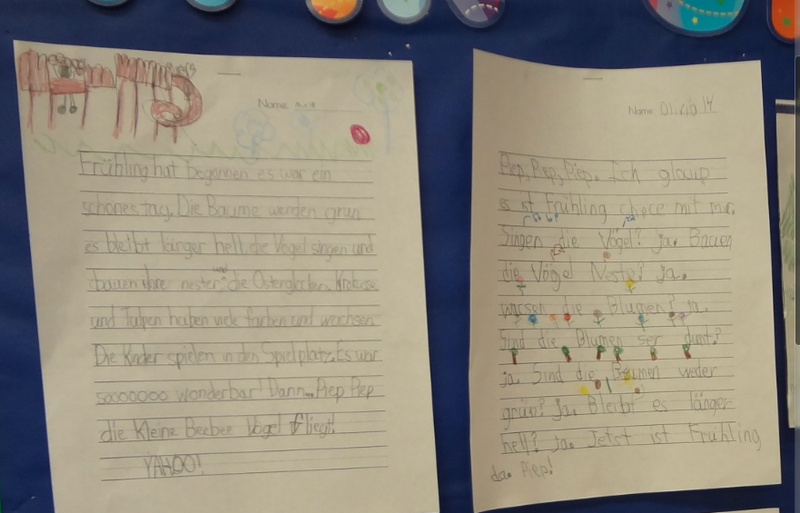 I admire one page essays by first-graders on the topic “Frühling”, written in such perfect German that I start wondering if I accidentally got lost in a second grade class. Many of the classrooms feature a piano and as I am glancing at one of the music sheets I recall my own elementary school years learning songs like “Brüderchen komm tanz mit mir…” Another class displays projects on ‘life cycles’ and a 3rd grade made a collage on the topic “Umweltverschmutzung” (pollution). Albert Einstein Academies – definitely a school worth checking out!